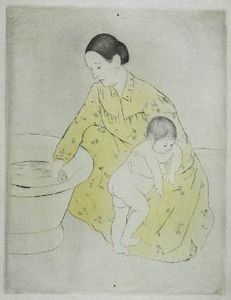 The Bath is a print, or a series of prints, made by Mary Cassatt in 1891 – at the height of her powers and at a moment when her interest in Japanese prints opened a wonderful set of visual ideas in her mind. 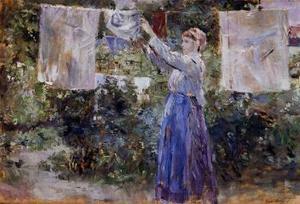 Many of Cassatt’s prints are now regarded as technical masterpieces. She pulled sheets herself in her studio, and also had the help of an extremely talented printer, Modeste Leroy, whom she took the unusual step of crediting, as is the Japanese tradition. The prints are marked Imprimée par l’artiste et M. Leroy / Mary Cassatt. At the Fogg Museum right now, one may see a sequence of nine versions of The Bath, the first print in a set of twenty-five. 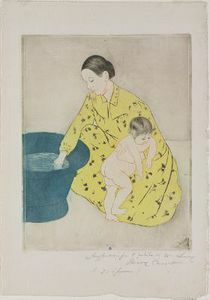 Cassatt worked on The Bath in a great many stages because, as she said, “I was entirely ignorant of the method when I began.” [Mary Cassatt: The Color Prints, p45] The whole series originally had the subtitle “an attempt at imitating Japanese printing,” although she later dropped this description. 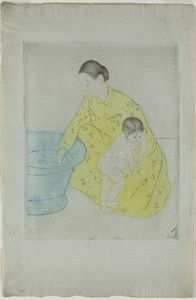 The Japanese influence on The Bath is evident right away. 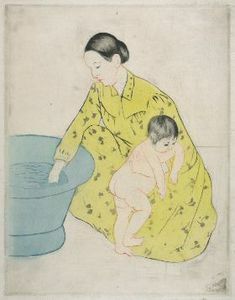 You can see it in the particular shade of blue that makes the basin of water a significant equal weight in the picture, in balance with the mother and the child; it is in the pattern on the yellow dress that has gone from being penciled in to being part of the plate; and it is in the outlined figures that seem almost cut out and then laid over the background. Cassatt’s color prints are stylized and also about style. Here style is not ornament. The hallmark of these prints may be their tenderness, but here style is paring down and juxtaposing in order to achieve a kind of force. At the Musée Marmottan last week a chance to really see Morisot: a whole room of the paintings; a smaller room with fifteen watercolors and a selection of works she owned; drawings by the artist and by members of her family; and a special exhibition of paintings from private collections that contained several further canvases. Struck, afresh, by the strange quality of paint as she used it. Very thick, the strokes seeming to hang almost like banners in the air, sometimes gauzier as curtains, but sometimes veritable stripes, and yet the works are of great transparency, luminous and fresh, the air always dewy, a light breeze stirring. Some of this she worked out from Corot, one of her early teachers and a good friend, whose thick greens also manage to be ever-light and full of air. 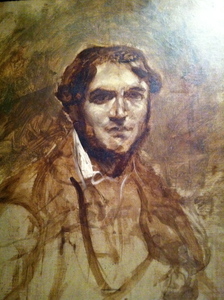 Some of the weight she had from Manet, the painter she probably worked in closest conjunction with, a lifelong companion in art, and in family life, since she was married to his brother. 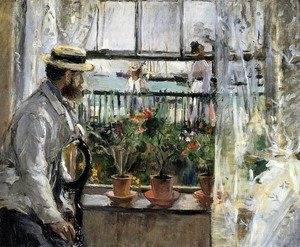 But where Manet is deliberately opaque, Morisot is spacious, and a peculiar kind of space, as if interior to the paint itself. The text at the Marmottan acclaims her, in my view rightly, one of the great watercolorists of her day, and suggests that her practice in watercolor influenced her objectives in paint. This seems plausible but does not really begin to answer the question: how? 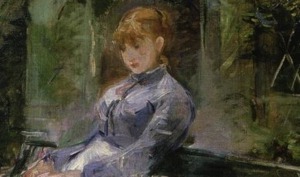 Some weeks later I remembered that I had read something about Berthe Morisot, long ago, in a book by Paul Valéry, a collection of occasional pieces about painting with the somewhat misleading title Degas, Manet, Morisot. 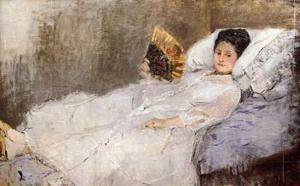 I hurried back to read the passages on Morisot, three really, altogether perhaps ten pages. 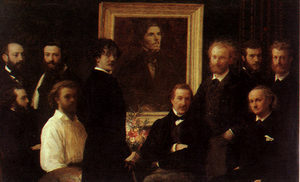 The man who wrote the introduction to the volume decided, rather ruefully, that, despite living among the Impressionists and being himself so intelligent, Valéry’s writing about them was only in a limited way perceptive. 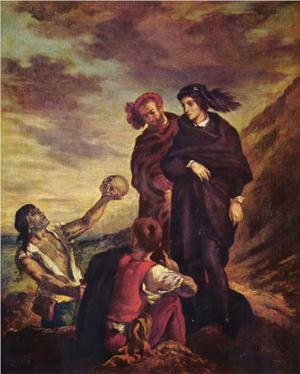 The poet seems in a way to take the painters and their achievements for granted. 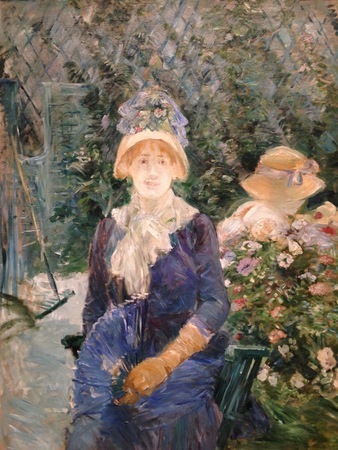 But, for me, these few passages, coming as they do from a man who was married to one of Morisot’s nieces, and lived in the house that had been Morisot’s, offer something more than useful about “Tante Berthe.” Morisot’s daughter and her cousins had grown up surrounded by paintings: Morisot’s and also those of their close friends – Renoir, Degas, Monet. 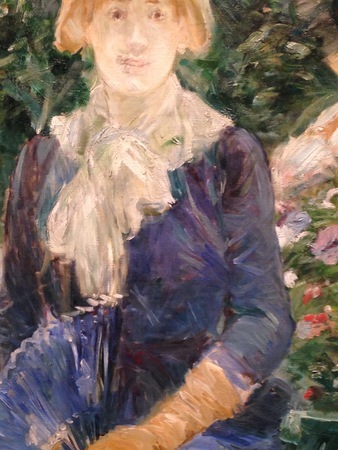 Berthe Morisot was Berthe Manet, as she was married to Édouard Manet’s brother, Eugène. I’ve read Morisot’s correspondence with Stephane Mallarmé now, too, and the letters give the impression of life intensively lived among a few choice acquaintances. “Rare and reserved,” Valéry says; the work, too, is private. The surprising texture of paint in her handling, the odd inward structure of the material, these phrases of Valéry’s, give something to think about. 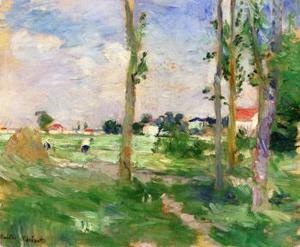 Landscape of La Creuse, 1882, Private Collection. 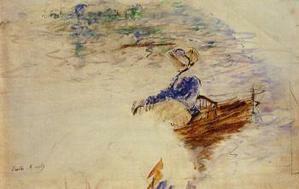 Young Woman in a Rowboat, Eventail, 1880, Private Collection. 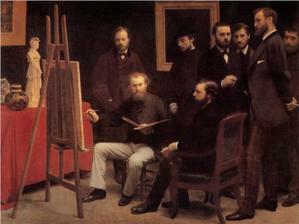 Citations from: Valéry, Paul, Degas, Manet, Morisot. Translated by David Paul. Edited by Jackson Matthews. With an Introduction by Douglas Cooper. Princeton University Press: 1960. 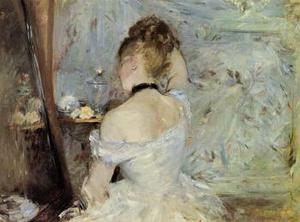 See much more Morisot at The Athenaeum. 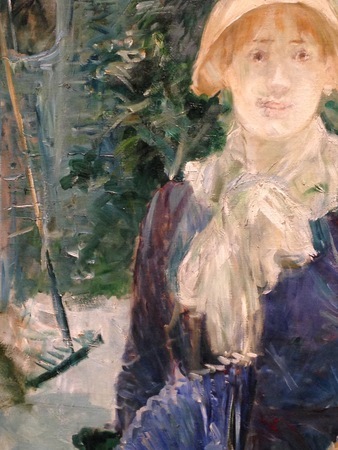 A small watercolor by Berthe Morisot was the most surprising thing I saw on our trip to New York. At the Frick, on loan from the Clark, in that basement space they use for special exhibitions and works on paper, in an assortment of drawings by French Impressionists. The watercolor is of a dark boat floating in green water among other crafts – masts, bow, lines for sail and anchor, a few indistinct figures moving about their work. Colors wonderful – shadows of boats reflecting darker green below, sense of movement, mass, buoyancy. Apparently she drew while herself on a neighboring boat and relished the difficulty of getting the lines while she herself went up and down. A much better draughtsman than I had realized, learning from Turner’s watercolors in ways that I’ve not seen others do, allowing the colors to make a structure. Who is she? Berthe Morisot. 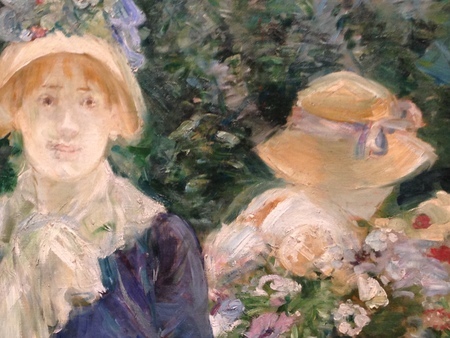 The images I know are of her, especially Manet’s portraits, not by her. At the Met later that day four or five really wonderful paintings by Morisot as part of their “Impressionism and Fashion” exhibition. The women in these paintings – reclining or sitting, looking in mirrors or at us – emerge out of a shaded and subtly modulated atmosphere. 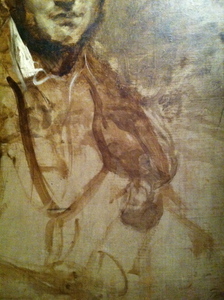 The air itself is thick with paint that condenses in the figure. Clothes are beautiful. A manifestation of what animates their wearers. These women have not been dressed, they dress themselves. I had little time, but tried to look carefully at just these paintings, promising myself that I would spend more time with them one by one in the museums where they reside. In the gift shop, quickly scanning the one book on Morisot, I saw to my disappointment that nearly all her work is in private collections. 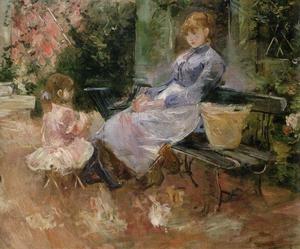 Click for complete works by Berthe Morisot available at The Athenaeum.